Large number of Dark Matter peaks found using Gravitational Lensing. A number of studies have shown that Dark Matter is the principal mass component of the Universe making up about 80% of the mass budget. 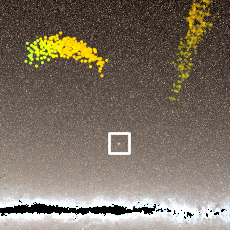 The most direct technique to reveal the Dark Matter distribution is by using the gravitational lensing technique. Indeed, following Einstein's theory of Gravitation, we know that a mass concentration will deform locally the Space-Time and the observed shapes of distant galaxies seen through the such concentration will be deflected and distorted. By measuring the exact shapes of millions of these distant galaxies we can then map accurately the mass distribution in the Universe, and identify the mass peaks tracing mass concentration along their line of sight. Importantly, the number of mass peaks as a function of the mass peak significance encodes important information on the cosmological world model. In particular this distribution is sensitive to the nature of Gravitational force at large scales as well as the geometry of the Universe. Measuring mass peaks is thus one of the most attractive way to probe the relative importance and nature of Dark Matter and Dark Energy, measure the evolution the Universe and predict its fate. This map shows the distribution of dark matter (black) in the Universe, overlapping with optical measured clusters of galaxies (red circles). The mass peaks in the map contain significant cosmological information, will provide us with an improved understanding about the dark side of the Universe. The size of this map is about 4 square degrees corresponding to only 2.5% of the full CS82 survey footprint shown in the next figure. In a new publication of the Monthly Notice of Royal Astronomical Society, an international team, comprising researchers from Swiss, France, Brazil, Canada, and Germany present the first detailed analysis of the weak lensing peaks. This work is considered as a milestone, given the possible importance of the weak lensing peaks for cosmology. Because mass peaks are identified in two–dimensional dark matter maps directly, they can provide constraints that are free from potential selection effects and biases involved in identifying and measuring the masses of galaxy clusters. In fact a small fraction of the max peaks are just mass concentration excess along the line of sight, and not genuine massive clusters. 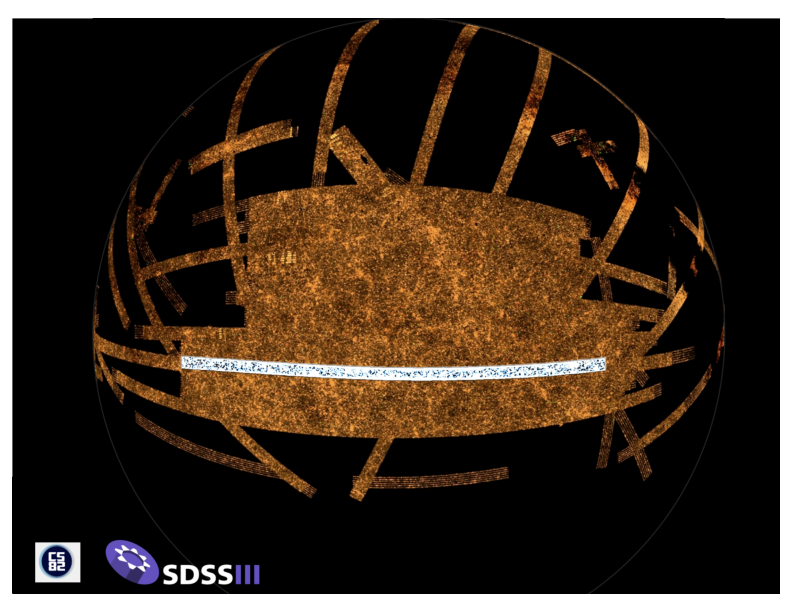 The background image (in brown colours) represent the SDSS imaging survey of the South Galactic cap comprising about 3200 square degrees. Over-plotted in white/blue is the distribution of Dark Matter derived from the CFHT/Megacam Stripe-82 observation over 170 square degrees. The mass peaks in the map contain significant cosmological information, and will provide us with an improved understanding about the dark side of the Universe. 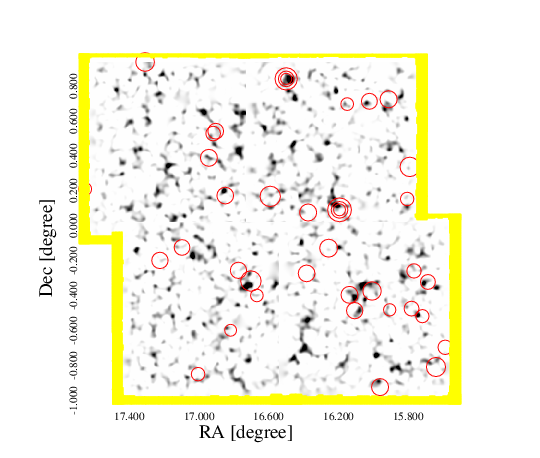 To detect the weak lensing mass peaks, the research team used the Canada-France-Hawaii Telescope Stripe 82 Survey (CS82 in short), still one of the largest weak lensing survey yet. The Survey covers ~170 square degrees of the Stripe 82 of the Sloan Digital Sky Survey (SDSS), an equatorial region of the South Galactic Cap that has been extensively studied by the SDSS project. With the precise shape measurement for more than four million faint distant galaxies, a dark matter mass map was generated. Huan Yuan Shan, the lead author of this publication explains that: "By studying the mass peaks in the map, we found that the abundance of mass peaks detected in CS82 is consistent with predictions from a ΛCDM cosmological model. This result confirms that the dark matter distribution from weak lensing measurement can be used as a cosmological probe". Jean-Paul Kneib, co-author of the publication explains that: "This work opens a new window to constrain cosmology with weak gravitational lensing. We can not only reveal where the dark matter is located using space-time distortion, but also use the distributions of mass peaks to better constrain and understand our Universe". Huan Yuan Shan, adds that: "Because of their large number, the small mass peaks in the Dark Matter maps contain more resolving power than the most massive peaks to constrain cosmological models". As a cosmological probe, the weak lensing mass peak abundance is very complementary to the other cosmology probes, such as the study of the Cosmological Microwave Background (CMB), the study of distant SuperNovae, the measure of the Baryonic Accoustic Oscillation and the cosmic shear. The abundance of mass peaks in the Dark Matter mass map confirms the theories of structure formation. In the near future, with the up-coming weak lensing surveys (to be conducted with the DES survey, LSST and Euclid), by precisely counting the peaks of dark matter mass maps, we will be able to set constrains on the nature of Dark Matter and Dark Energy. The CFHT Stripe 82 (CS82) collaboration comprises scientists from the following institutions: University of British Columbia (Canada), Laboratoire d'Astrophysique de Marseille (France), Brazilian Center for Physics Research (Brazil), École Polytechnique Fédérale de Lausanne (Switzerland), Institute for the Physics and Mathematics of the Universe (Japan), Universität Bonn (Germany), Institut d'Astrophysique de Paris (France), Valongo Observatory/Federal University of Rio de Janeiro (Brazil), Instituto de Astronomia, Geofísica e Ciências Atmosféricas - USP (Brazil), Instituto de Física - UFRGS (Brazil), Observatório Nacional (Brazil), Universitá deli studi di Ferrara (Italy), University of Hertfordshire (UK), University of Oxford (UK), University College London (UK), University of Waterloo (Canada), Leiden Observatory (Netherlands), Lawrence Berkeley National Laboratory (USA), University of California Berkeley (USA), Stanford (USA). 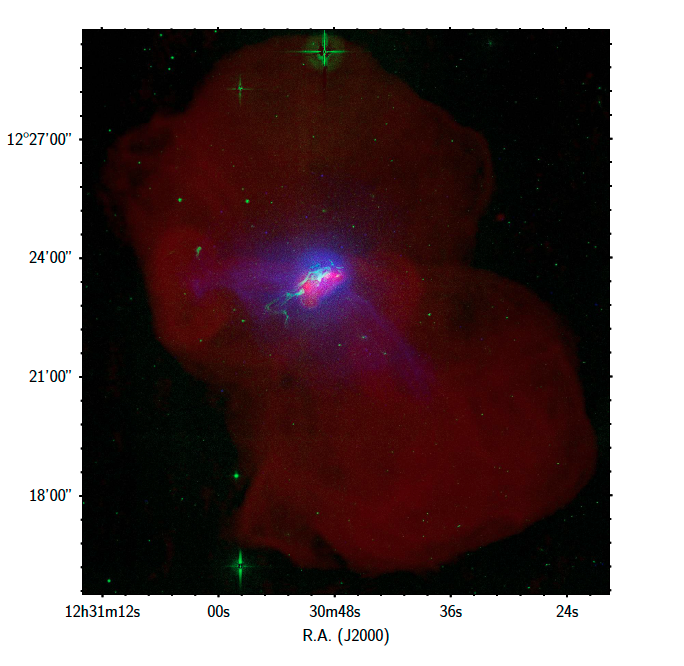 The CS82 survey is based on observations obtained with MegaPrime/MegaCam, a joint project of CFHT and CEA/DAPNIA, at the Canada-France-Hawaii Telescope (CFHT), which is operated by the National Research Council (NRC) of Canada, the Institut National des Science de l'Univers of the Centre National de la Recherche Scientifique (CNRS) of France, and the University of Hawaii. The Brazilian partnership on CFHT is managed by the Laboratório Nacional de Astrofísica (LNA). We thank the support of the Laboratório Interinstitucional de e-Astronomia (LIneA). We thank the CFHTLensS team through the expertise they built in analysing CFHT/Megacam weak lensing data.